Established in 1990, the Alessandro Palace has become one of the most popular hostels in Rome for backpackers and independent travellers worldwide. The Alessandro Palace Hostel provides energy-saving air-conditioning and heating units as well as bathrooms in every room. Located in a safe central area, were a short five-minute walk from Termini, Rome's central transportation hub for buses, metro, taxi stops, and trains to get you where you want to go. This is one of the few hostels in Rome to have its own onsite pub with satellite TV and the cheapest drink specials in town. Furthermore, were a proud selected member of Europe's Famous Hostels. 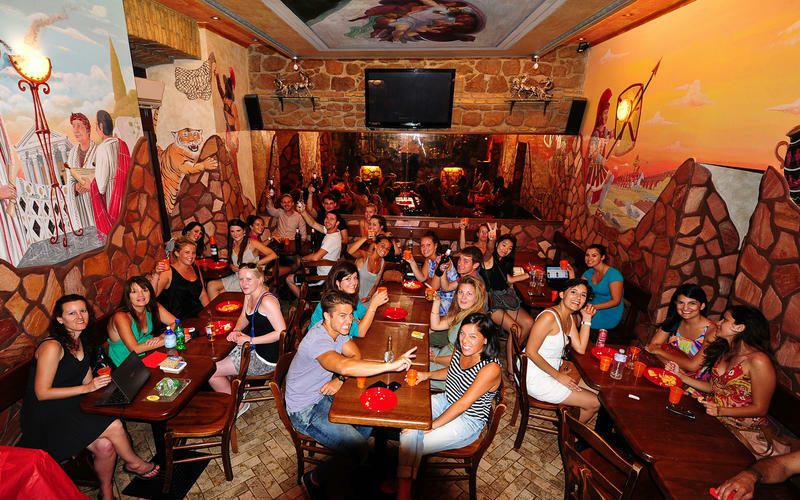 Our hostel boasts traditional Roman-style architecture and atmosphere. Michelangelo's masterpiece The Creation is painted on the ceiling, welcoming you along with our friendly bar staff. Its the perfect place to sit back, relax and chat with fellow travellers over a beer! A wide-screen TV with satellite and a surround-sound speaker system keeps you entertained with all the sports and music until late. The bar offers a Wi-Fi connection and special events like free parties, games, the cheapest drinks in town and happy hour every night. Its open from 6pm until 2am (last call 1:30am) every night! Were happy to announce our brand-new private rooms in our annex! Just one minutes walk from our main building, all rooms in the annex are equipped with TV, mini-fridge, air conditioning, Wi-Fi and lockers or safe. Rooms come either ensuite or with shared bathroom. The doubles are very comfortable with a TV, mini-fridge and a safe. All rooms are ensuite and include linen and blankets. We also have air conditioning and heating units (at any time in the double rooms but time controlled in the dorms). All dorm rooms have lockers please bring your own padlock. We have hot showers, an elevator, free city maps, a tourist info stand, vending machines and a 4 Euro breakfast featuring ham, cheese, jam, butter, bread, cereals, fruit, hot and cold drinks and milk. Youre welcome to use our free luggage storage before check-in and after check-out. Theres also internet access in the computer room for a nominal fee. We have a high standard of security, with key card access, a video surveillance system, fire alarm system and fireproof doors. Were open throughout the year with 24hr reception and no curfew. This is a meeting point for walking tours. Our convenient central location means were close to supermarkets and historic sites like the Colosseum, Roman Forum, San Pietro in Vincoli, the Basilica Santa Maria Maggiore, the shopping mecca of Spanish Steps, Trevi Fountain and the classy Via Veneto. Theres also Laundromats and restaurants nearby offering special discounts to our guests.